Learn about the variety of options you have for your ads. An ad is an individual online advertisement displayed to a potential customer. You'll often see ads referred to in the context of an ad group or a campaign. An ad group contains one or more ads and keywords, while a campaign contains one or more ad groups. 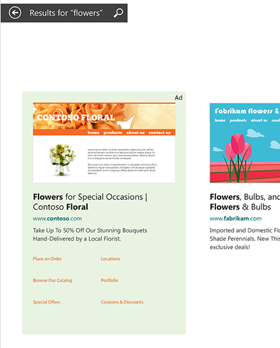 Ad title (supports three headlines, up to 30 characters each, separated by a space, vertical bar, and space (" | ")) Flowers for any occasion | Delivered right to your door! Ad text (supports two descriptions, up to two 90 characters each) Sustainably grown flowers on sale and ready to ship within 4 hours. When you create your ad, Bing Ads shows you a preview of what your ad will look like on desktops, mobile devices, and tablets on Bing search results pages. This could change depending on how Bing formats your ads. Bing does experiment with ad formats to provide the best ad experience possible to customers. Create targeted and relevant ads automatically: New, dynamically-created ads for every search query based on your entire website, or on specific pages or categories of your site. Reduce your workload: No need to maintain keyword lists, manage bids, or update and customize ad titles. Find missed opportunities: Automatically adapt to new queries to drive additional conversions. To learn more, see Target searches automatically with dynamic search ads. Products ads include custom images from your own product catalogs (created in Bing Merchant Center), plus specific promotional text, pricing, and seller details. For more information about Product ads, check out What are product ads? Product ads can only be created in Bing Merchant Center, as Bing Shopping Campaigns. This feature is currently available in the United States, Canada, the United Kingdom, and Australia. Microsoft Audience Ads is a native advertising solution optimized for search advertisers. This feature enables advertisers to get additional high-quality traffic from non-search placements. Microsoft Audience Ads experiences, such as ads placed within articles, are engaging for users, integrate naturally into page content, and deliver visually rich ads for advertisers. Microsoft Audience Ads appear on the Microsoft Audience Network. These ad placements are cross-device and include premium sites like MSN, Microsoft Outlook, Microsoft Edge, and other partners (with more to come). To learn more, see About Microsoft Audience Ads. Bing Smart Search ads are similar to text ads on the Bing, AOL, and Yahoo search network sites, but formatted for the modern touch experience and displayed in the Windows 8.1 Smart Search results. When possible, these ads will include a preview of your landing page. Bing Ads in Windows 8.1 Smart Search are available in the United States, United Kingdom, and Canada (English). To learn more, see Bing Ads in Bing Smart Search. Not everyone has this feature yet. If you don’t, don’t worry. It's coming soon! App Install Ads are only available in the United States and on iOS and Android only. To learn more, see What is an App Install Ad? As of August 2017, you can no longer create or edit standard text ads (you can still pause and unpause them). Existing standard text ads will continue to serve for the foreseeable future, but we encourage you to upgrade them to Expanded Text Ads. Check out this blog post for more information. 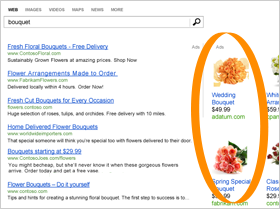 Standard text ads are the most basic type of ad displayed in Bing Network search results. Depending on the text of the ad and other factors such as placement within the search results, the actual layout of the ad can vary. If the first sentence of your ad text meets the below criteria, it will be added to your ad title, making it a "long ad title." If your ad title does not meet the requirements above, Bing automatically adds the display URL (without any URL extensions) to your ad title. If you prefer not to use long ad titles in your ads due to branding or other reasons, you can opt out by contacting support.